The PHOWN (PHOtos of Weaver Nests) database has shown record growth during October; 608 PHOWN records were submitted. The project started in July 2010 and the previous monthly record was 277 (in Sep 2012). Well done to all PHOWN participants! Most records in October were submitted by Pieter Cronje, who travels around Africa as a Human Rights Lawyer, and uses the opportunity to submit records (see his records here). 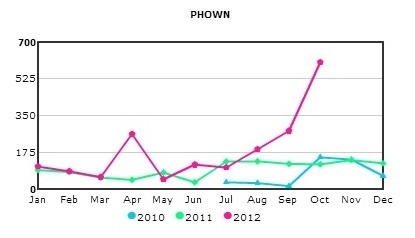 PHOWN now has over 4000 records, contributed by 200 participants, who have counted over 62000 nests! Slightly over half of the world's weaver species have at least one PHOWN record, and PHOWN is already adding new knowledge of breeding information of weavers (eg new nesting association for Kilombero Weaver). Also during October Rene Navarro, who designed the Animal Demography Unit's Virtual Museum software, designed a new logo for PHOWN, using the Southern Masked Weaver head on a map of Africa, to resemble the logos of most of the other Virtual Museum projects. Note, however, that PHOWN is not restricted to Africa, but welcomes nesting records of weavers throughout their range. Records of introduced weavers that have established wild breeding populations outside of their natural range are welcome, eg weavers have been introduced to Australia (see here), America, Europe and other localities. See PHOWN summaries here and the Virtual Museum upload site here.